“Starting on Saturday, 8th September and Ending on Sunday, 16th September 2018, The mood of Bandra Fair is picking up gradually. 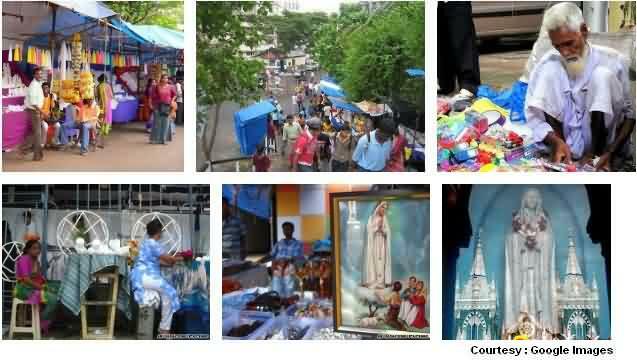 Mount Mary (The Blessed Virgin Mary) has blessed the devotees since many decades at one of the oldest Roman Catholic Church of Mumbai Suburban Bandra Station. Last Day of Mount Mary Bandra Fair and Here is the Last day view 2017..
Mount Mary ( Known for ‘Mother Mary’), Mother of lord ‘Jesus Christ’ was born on September 8, and the church has some historic stories and now a monument of Mumbai. The fair marks the birthday celebration at destined Mother mary starts every year on second week of September that last for 8 days with church filled with devotees around Mumbai and from outside city too. Lakhs of visitors are seen every year with heart full of wishes and hands open asking for blessings for happy life and lots more. Fair also brings fun and excitement with cool breeze around the church due to the coastal front. 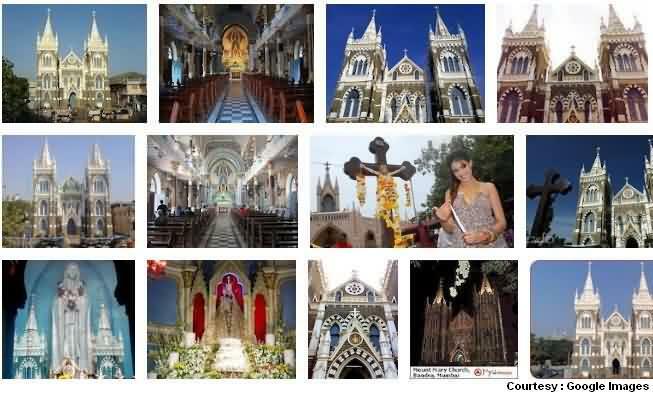 The church stands beautifully at about 70 to 80 meters at the hillock area of the famous Bandra promenade area with a steep sloppy exit towards fort and hotel Taj area all famously known as Bandstand Lovers Point. There is one more church which is quite old which attracted very huge crowd just couple of decades back, called ‘Father Agnel’. Complete promenade is a famous tourist attraction as many Bollywood celebrities like ‘Shahrukh Khan’ and ‘Salman Khan’ resides here. Sundays attract many Christians for prayers and mass, and other days too see many visitors around Mumbai and tourist in city. Few years back Bandra church was in news as local residents complaint about the hawkers and illegal stalls that creates congestions leading to inconvenience and kind of nuisance due to honking and parking issues. So the strict no parking rules and one way restrictions implemented (Details below). This Year 2018 : Bandra Fair Starts on 8th September 2018 (Saturday) and Ends on 16th September 2018 (Sunday). Last Year : 2017 the fair starts on 10th of September and Ends (last day) on 17th September. WHAT IS DIFFERENT THIS YEAR ? Thermacol & Plastic ban is strictly followed at stalls and all around. Children are among the most excited among other people who visits Bandra fair as they get more attracted towards the fun & fair and get an opportunity to buy toys, dhols, flying toys and bubbles pack and and other goodies and most commonly enjoying shooting the balloons game and winning prices. Christian community around Mumbai city makes sure of visiting Bandra Church at least during this festive season if not otherwise in the year. Pilgrims coming from far often offer candles along with prayers and Candles of various shapes and sizes are one main attraction around the church which is highly sold every single day of the fair and otherwise too. These 8 days brings business opportunities to all those candle business and other hawkers seen around. Even Non-Christians like Hindus and Muslims visit the Church or Just the fair that covers hilly footsteps around of Mount Mary church at end of Monsoon and then spend leisure time at sea shore. As discussed earlier, Bandra church was under regular headlines during September 2010, This was time when local residents complained about those illegal stalls that increasingly seen during those 8 days of fair. As per the news legally only 165 stalls were allowed by authorities, yet it was found that hundreds of other hawkers came around and encroached the area for their business which lead to traffic problems and other nuisances related. The matter reached Mumbai High Court who finally ordered to remove those illegal stalls and strict applied with only 165 licensed hawkers allowed. Year 2018, About 430 total stalls were allowed to sell only rituals and religious products in the premise from which about 100 to 120 odd stall are in walk way steps of church. Maximum were reserved for old residents who are local business people since decades. About 200 stalls are auctioned and funds are received by BMC. Security : With such huge crowd in, Security is always a concern. So, Private volunteers and Securities along with few hundreds of policemen are always keeping watch on people and activity around. CCTV cameras are all in place, Strict checking always done in case of any doubts. By Train : This church is located in Bandra West near the famous Bandstand area. Buses and auto’s are easily available from Bandra station, Bus cost about Rs.10 as single fare. Auto runs on regular metre system. Special bus services by BEST is done for all these fair days for convenience and more than 300 extra buses are scheduled. By Car : If you are coming from outside Mumbai, Keep on Western Express Highway (Mumbai Ahmedabad National Highway 8) and upon reaching Bandra take Kalanagar flyover and then the east west flyover that goes straight to Bandra Worli Sea Link. IMPORTANT : Follow the road signs around Bandra reclamation are and follow S V Road sign which takes a circular turn on bridge, Then Follow the Hill road and park at proper location as there are restrictions near Church area for those Bandra fair festive days. Another known Church is ‘Father Agnel’ which is adjacent to the exit of Mount mary on carter Road. Checkout that famous Hotel Taj, Residence of Shahrukh khans ‘Mannat’, and Next to it stays handsome hunk Salman Khan At Galaxy Apartment at on same promenade Rocky Sea Facing area within 100 to 300 meters belt. Bandra’s famous Joggers park and Linking Road for shopping are few more places around. Road traffic is restricted for all 8 days of fair in and around Mount Mary Church for smooth festive functionality between 6:00 Am and 11:00 Pm. Local residents get valid pass from police station who are the only people with vehicles allowed at restricted Mount Mary Road and St John Baptista Road and other lanes. Ambulances and Fire vehicles etc are Exceptions. No Entry : 4 major roads around church area has restrictions on Entry, they are Mount Mary Road, Chapel Road, Kane Road and Saint Baptist Road. Parking : You cannot park in and around Mt Carmel Road, Mount Mary Road, Chapen Road, Hill Road between Mehboob Studio and St Pauls, Bandra Station Road (Dhondopant Road), Turner Road Junction till Station (Guru Nanak Road). 2 Locations allowed for parking are Behramji Jijibhai Road Band Stand (Sea Shore side) and Supari Tank Ground. One Way : Bandra Railway Station West till S V Road Junction, S V Road Junction till St Paul Road Junction, B J Road till Mehboob Studio both on Hill road, Turner Road (Gurunanak Road, Manuel Gonsalves Road till Station). Local Residents and Car Passes : From 6 Am till 11 Pm the main Mount Mary Road and St John Baptista Road will be strictly closed for all vehicles except local residents who has valid passes procured from Bandra Police Station for all 8 days.